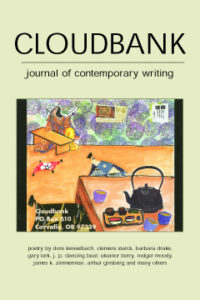 Cloudbank 5 includes poetry and flash fiction by Dore Kiesselbach, Clemens Starck, Babara Drake, Gary Lark, J.P. Dancing Bear, Eleanor Berry, Rodger Moody and others. Floating Verses by Jim Shugrue, White Shirt by Christopher Buckley, and Birds of Paradise by Christine Kitano are reviewed. Imaginative twists and turns can add bling to a poem. Unexpected juxtapositions can help us see things in a new way. Associations are made in the poet’s mind not on rational basis, but more in the context of a poetic logic that operates outside the rational universe. A good example is “Potato” by Shinkichi Takahashi. there are mountains and rivers. This poem can be read on many levels: 1) Do we sometimes overlook the marvelous concealed within the mundane? 2) Now that’s an exciting associative and imaginative leap: transforming a vegetable into a Bierstadt landscape. (Of course, this depends somewhat on the visualizing power of the reader.) 3) What a nut! What has Takahashi been smoking? with spurs behind the kitchen. Ouch. It’s one thing to be looking for the poet in our hand, but do we really want him in our shoes? And the night with “spurs behind the kitchen” sounds pretty scary, like something out of Bram Stoker or Edgar Allan Poe, rather than one of Peru’s best-loved poets.